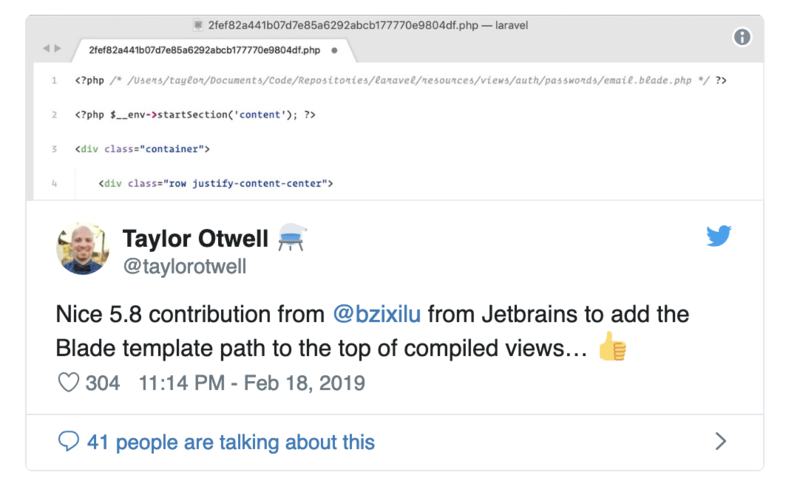 Laravel 5.8 was released on February, 26th 2019. This new release continues the improvements made in the previous release (version 5.7), as well as new features which includes support for the postmark email service, “has-one-through” Eloquent relationships, improved email validation, and many others. As an improvement to the Laravel email validator, a package used by SwiftMailer was utilized. Thanks to a package by egulias/email-validator , email validation logic in Laravel 5.8 has been improved. As a result of this improvement, email addresses such as hello@yölo.com will pass as valid, because it now has support for international characters. Laravel 5.8 comes with a few improvements such as resource key preservation, higher order orWhere method and HasOnethrough relationships. In this section, we will take a look at these new features. In Laravel 5.7, when returning a resource collection, Laravel resets the collection keys so they are in numerical order. Laravel 5.8 makes it possible to preserve collection keys by setting the preservedKeys property in the App\Http\Resources namespace to true when this is done, the collection keys will be preserved. The eloquent HasOneThrough relationship was an issue raised by Dwight Watson on the 13th of May 2015 and was finally worked on by Dries Vints. This relationship makes it possible to link models using a single intermediate relation or a middle man. Where App\History is the model we want to access and App\User the pivot model. To know more about the HasOneThrough relationship you can check out the Laravel documentation. This method makes it easy to upgrade existing applications to Laravel 5.8 instead of explicitly converting every instance of cache time in minutes to seconds. In Laravel 5.8, Laravel places a comment at the top of every Blade file, which provides a path to the original Blade template file. This is feature helps Blade debugging in the PhpStorm IDE by JetBrains. There are two major improvements to the Laravel CLI (artisan), they are: the artisan call and the artisan serve commands. Version 5.8 brings some improvement to Laravel’s CLI tool (Artisan). In the previous versions of Laravel, the php artisan serve command could only serve on port 8000 by default. This new feature makes it possible to serve more than one Laravel applications at once, by utilizing all available ports between 8000 - 8009. This had to be done for every policy created in the application. With Laravel 5.8, the need for policy registration was eliminated so long as the naming and location of policies were according to standard. Laravel 5.8 ships with support for the version 3.0 of dotenv. Dotenv helps users keep environment variables such as API keys, server login details and any other sensitive information. This will return the string with white spaces and new line intact as opposed to the version two and one where “to a new line” will be stripped from the string. To know more about dotenv you can checkout its GitHub page. Laravel 5.8 comes with added support for some libraries such as carbon, pheanstalk and DynamoDB. 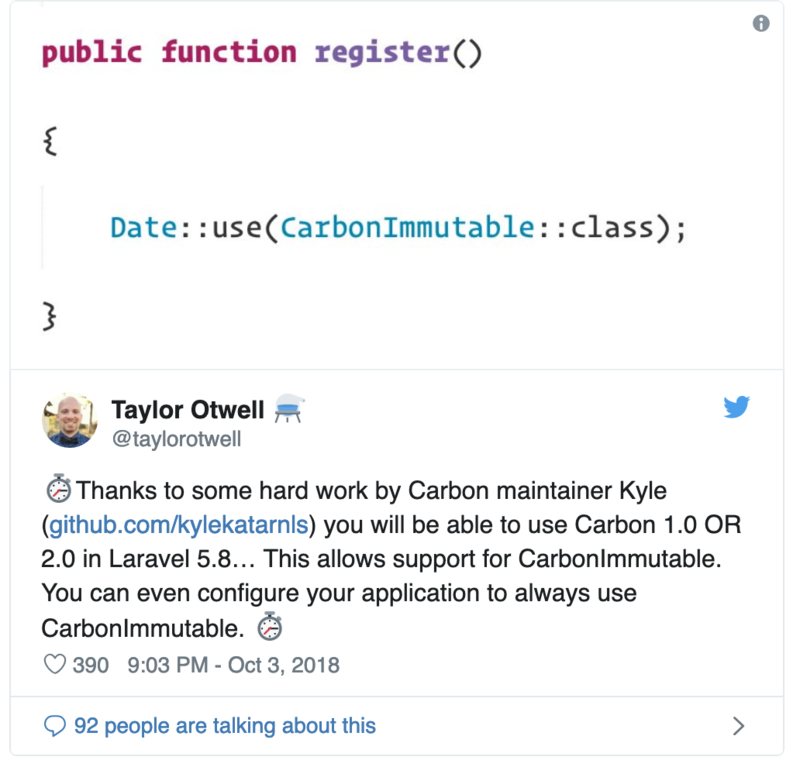 The 2.0 release of the Carbon date manipulation library comes out of the box in Laravel 5.8. This removes the extra step of including Carbon in multiple Laravel application individually. Postmark is a fast and reliable email service used to send transactional mails. 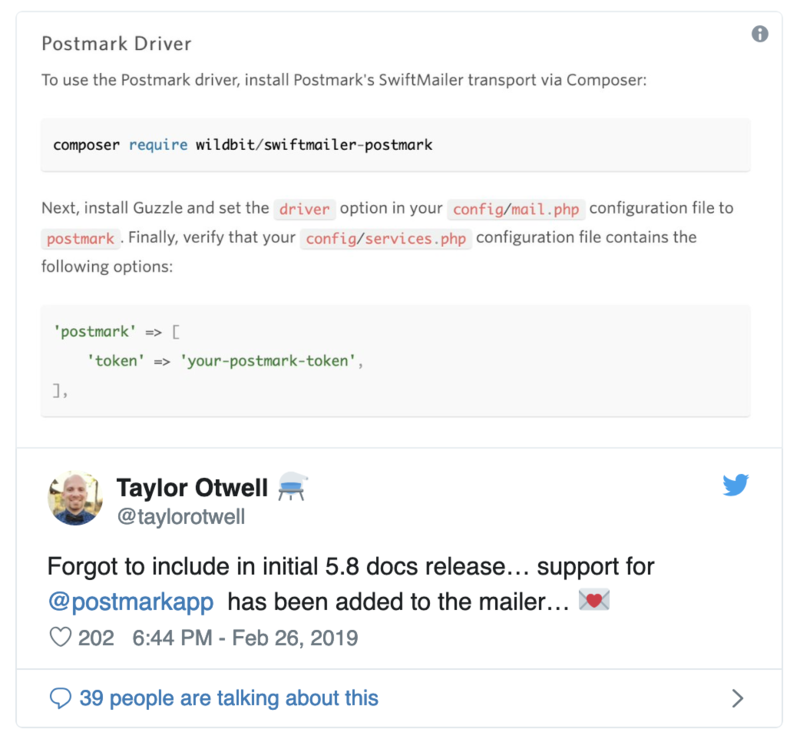 Laravel 5.8 makes it possible to utilize the Postmark mail driver as seen below. To check out pricing plans, documentation, and other features of the Postmark app on this link. In this tutorial, we have looked at the new features of Laravel 5.8. To upgrade your current application to version 5.8, you can check out the upgrade guide as well as the release notes.